McLaren appears on a mission to make up for its adolescence in the series-production world by pumping out models at a ridiculous pace. Since McLaren Automotive took over for the dormant McLaren Cars in 2010, the company has produced 12 distinct models (including the new 600LT). By comparison, Lamborghini — which has about the same number of employees — has put out half as many cars in that time (including three ultra-low-volume models). One would think this rate of expansion would diminish vehicle quality, yet each new McLaren is vastly improved over the last. No doubt the company’s laser focus on supercar development, without detours to build SUVs or other volume models, compels its innovation and execution. 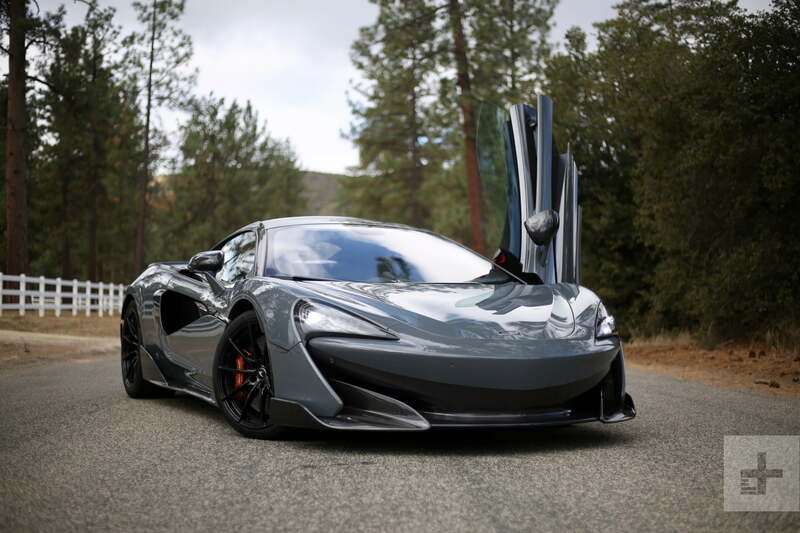 Whatever the cause, we’re downright giddy to take the helm of McLaren’s latest offering. 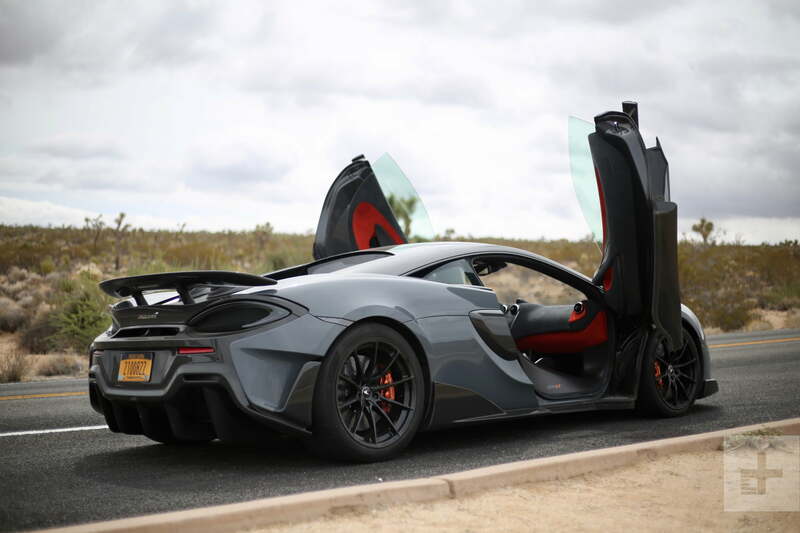 Following the F1 GTR and the coupe and convertible variants of the 675LT, the 600LT is McLaren’s fourth long tail model and the current ruler of its Sport Series range. Like its LT kin, the 600LT is lighter, more aerodynamic, more powerful, more driver-focused, better suited to track duty, and built in fewer numbers than the car upon which it’s based (in this case, the 570S). Though there are several track-honed supercars on sale today, the 592-horsepower McLaren is uniquely positioned. At $242,500 to start, it undercuts the $274,390, 630-hp Lamborghini Huracan Performante, but far exceeds the $188,500, 520-hp Porsche 911 GT3 RS. Power output is only one consideration, however; performance on road and track will either prove the 600LT a bargain or overpriced alternative. As a street legal track car, the 600LT makes few concessions to passenger convenience or entertainment (beyond the thrills of high-G cornering). Like the 570S, the 600LT features a 7.0-inch vertically oriented touchscreen display that remains as finicky, slow to respond, and visually underwhelming as ever. Sure, housing all the infotainment and HVAC functions within one slender screen cuts down on the cabin’s clutter, but we wish the 600LT had adopted the 720S’ improved module. Oh, and those who wear polarized sunglasses will have a heck of a time reading the screen unless they tilt their head sideways –seriously. 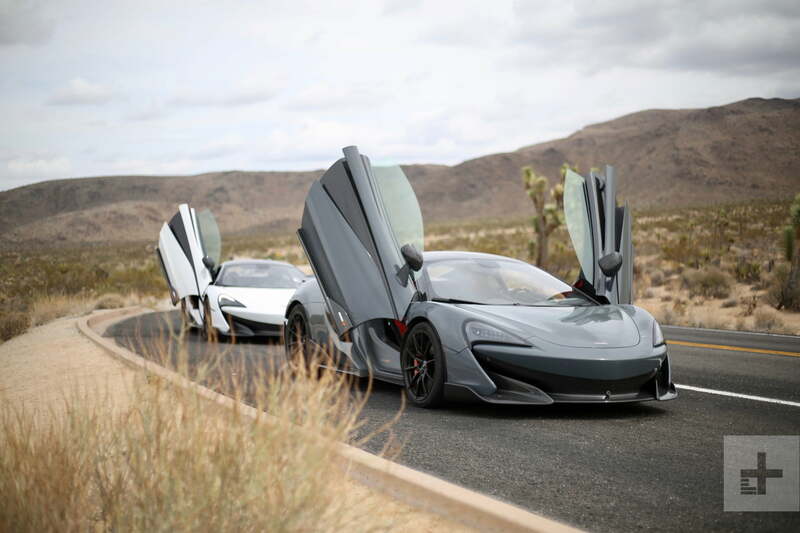 In a straight line, the 600LT is ferocious: Zero to 60 mph takes 2.9 seconds and top speed is reached at 204 mph. Thankfully, the 7.0-inch TFT driver display is better executed with sharper graphics, a smarter layout, and cool visuals. When dialed up to track mode, the 600LT’s gauge cluster turns into a full-screen, horizontal rpm monitor with shift indicator lights. If that doesn’t make you feel like a hero, what does? 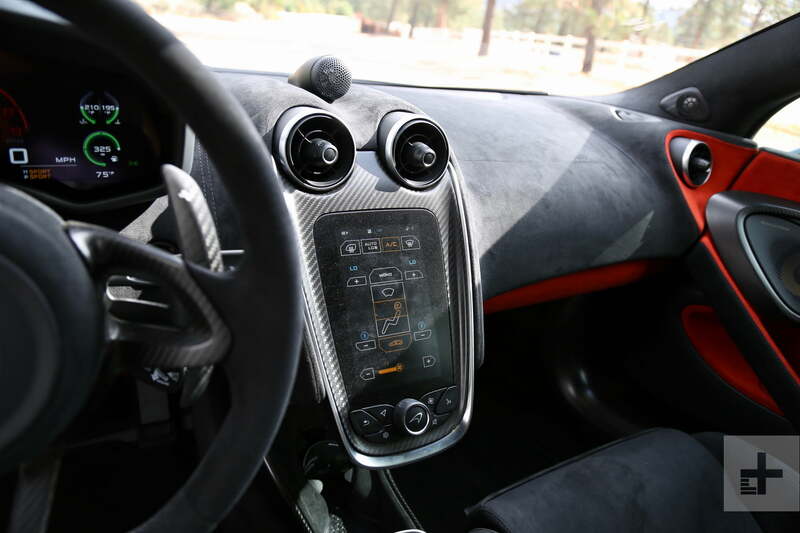 In addition to these standard screens, McLaren offers a 12-speaker Bowers & Wilkins sound system (which can’t beat the 600LT’s natural soundtrack) and, more appropriately, a three-camera system plus a data recorder app to review track day footage. At a time when 700 horsepower can be had for as little as $68,000, how can McLaren justify the 600LT’s 592 hp and 457 pound-feet of torque? With a sub-3,000-pound curb weight, it turns out. While they were busy culling 30 more horses and 15 additional lb-ft of torque from the 570S’ 3.8-liter twin-turbocharged V8, McLaren’s engineers were also looking for every opportunity to offload heft. 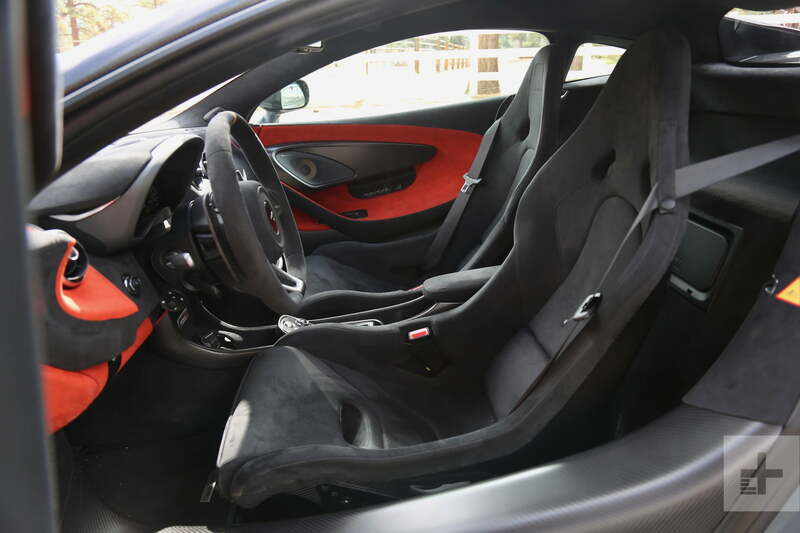 Replacing the stock leather seats with carbon fiber sport buckets saved 46.3 pounds. Fitting 10-spoke, ultra-lightweight wheels wrapped in Pirelli Trofeo R tires netted 37.5 pounds. Tearing out the A/C shaved 27.8 pounds, utilizing stainless steel top exit exhausts pulled another 27.8 pounds, fitting suspension components from the 720S scored 22.5 pounds, making the front and rear bodywork with carbon fiber extracted 15.9 pounds, and a handful of other weight savings measures removed an additional 49.7 pounds. In total, 220.5 pounds melted off the 570S’ frame. Removing that kind of weight from a two-ton sedan or three-ton truck makes little difference, but dropping it from a supercar changes the game entirely. In a straight line, the 600LT is ferocious: Zero to 60 mph takes 2.9 seconds, zero to 124 mph is an 8.2-second exercise, and top speed is reached at 204 mph. While those budget 700-hp mobiles are still clawing for traction, you’ll already be into the next county. Haters can’t even credit an all-wheel drive system for the 600LT’s brutal acceleration. Instead, a set of grippy tires, a rapid-shifting seven-speed dual-clutch automatic, and a sophisticated launch control system optimize the 600LT’s rear-wheel drivetrain. We rarely have sufficient on-road seat time in track-focused supercars. This time, two days and 292 miles of highway, city, and back road travel gave us a solid feel for the 600LT’s livability. Despite a rigid chassis and firm dampers, the car is no torture chamber on public roads. At the pull of a paddle, the 600LT hydraulically lifts its nose to creep over bumps or steep driveways. Rough pavement is felt through the chassis but it doesn’t punish the spine. Good visibility and large door mirrors cut down on blind spots. 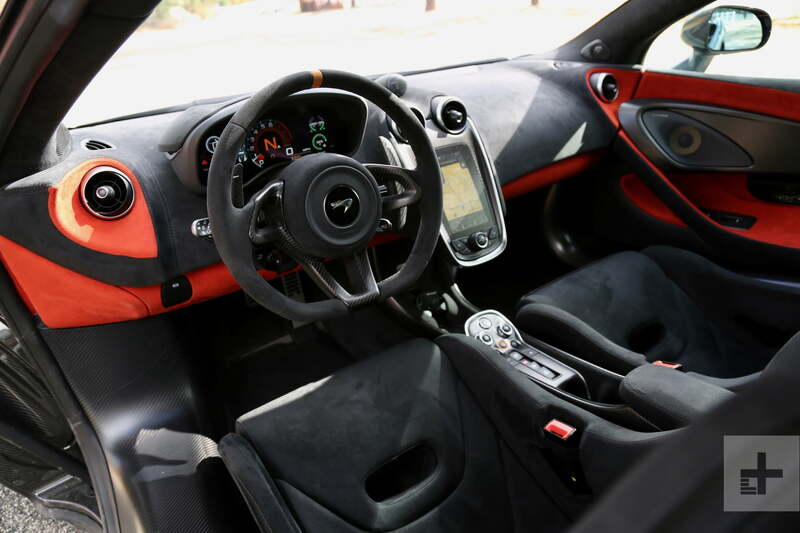 It’s not all perfect: even in normal mode, McLaren’s dual-clutch transmission holds on to gears like we’re putting down hot laps, and the standard carbon fiber chairs lack anything resembling lumbar support. Running short errands or making trips to and from the track won’t be an issue, but few owners will complete a road trip without a few aches and pains. But enough about the mundane; let’s move on to the business of track taming. Palm Desert’s Thermal Club is a 344-acre oasis for motorsport enthusiasts. It houses a skid pad, a resort, a repair center, and, most importantly, 5.1 miles of winding tarmac. Of the various track layouts, North Palm is the most demanding. 2.7 miles and 18 corners punish a car’s brakes, tires, and suspension components until man or machine throws in the towel. If the 600LT has a flaw, this circuit will show it. We take our orientation laps in the Sport powertrain and suspension modes, which sharpens the throttle response, shift timing, and damper stiffness noticeably. The hint of high grip levels we’d noted on twisty mountain roads becomes a clear message in a controlled driving environment. Stability under modest G loads is stellar and weight transfer through two sets of chicanes doesn’t unsettle the 600LT even slightly. Steering is crisp, with the perfect amount of weight. The hydraulic rack communicates in a way today’s electrically boosted racks will never match. 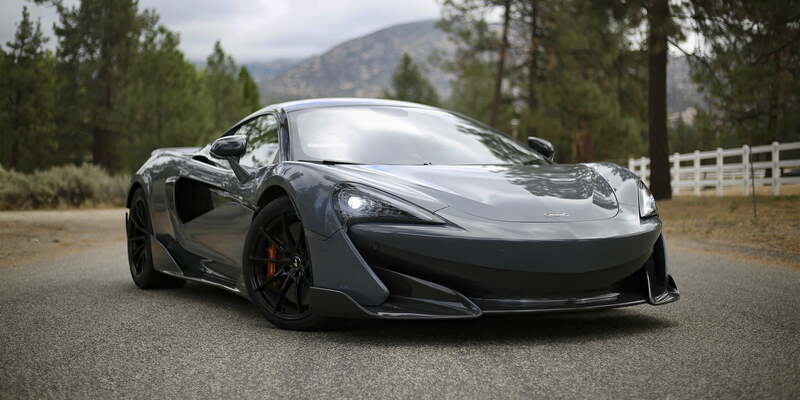 The track-honed LT adds the athletic muscle tone we’ve been missing from the 570S. Feeling more comfortable with the track and itching to prod the 600LT further, we switch both settings to Track and take over manual control of gear changes. The change in performance is drastic. Claws are out, muscles are tensed; the 600LT begs to discharge its energy. We abide. Finessing the supercar through double-apex corners and out of bends at full throttle requires all the focus we can muster. Smooth inputs to the wheel and micro adjustments of the throttle and brake dig gold from the chassis and suspension tuning. We’d profess our love to the brakes, but they wouldn’t believe our sentiment after all this aggression. Every ounce of weight saved is felt in the near-effortless stops and rapid changes of direction. Immense traction out of corners and instant gear changes give urgency to the 600LT down the straight, though outright power is clearly down compared to rivals like Lamborghini’s Huracan Performante. 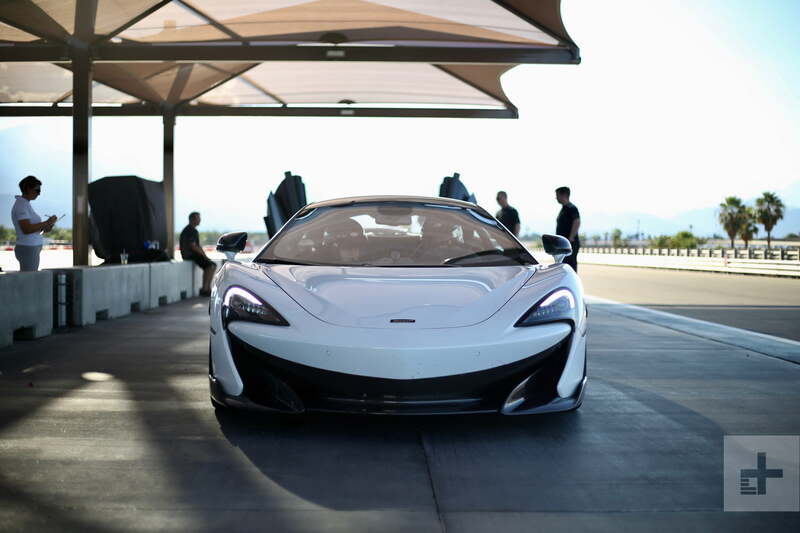 Even at our best, the 600LT has more to give (a fact made obvious during our hot laps with a pro driver at the wheel). Still, rather than feeling like a terrifying or unattainable track weapon, the 600LT facilitates driver development — and isn’t that the whole point of these vehicles? Those who’ve spent some time behind the wheel of the Senna hypercar seem to have forgiven its appearance — its form does, after all, facilitate incredible function — but when competing against style icons like Ferrari and Lamborghini, McLaren can’t completely give in to practical design. Graciously, the 600LT’s aerodynamic improvements in fact enhance its curb appeal. An extended carbon fiber front splitter channels air around, over, under, and through the car’s body. The flat floor includes two new intakes to direct cooling air onto the front brakes. Carbon fiber side skirts and oh-so-badass aero winglets just behind the front wheels further optimize airflow. To press into more nerdy details, the side intakes have been enlarged by 0.6 inches, which, along with improved cowling and ducting, lead to a four-degree cooling improvement. The rear bodywork has been extended by 1.9 inches, which allows the fixed rear wing to be mounted further back for greater aero efficiency. A new carbon fiber rear diffuser is wider, taller, and has deeper vanes than the 570S. 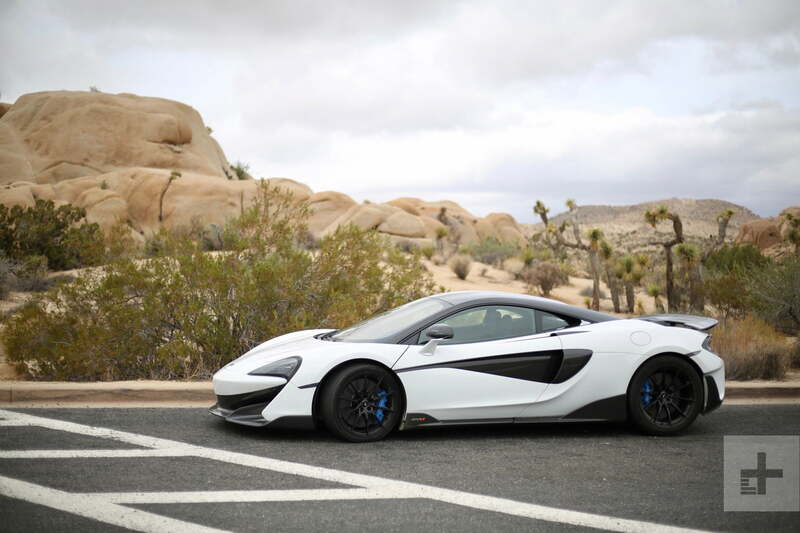 As a package, the 600LT is three inches longer than other Sport Series models. McLaren’s 600LT is neither an entry point nor an upscale member of the dedicated track car set. 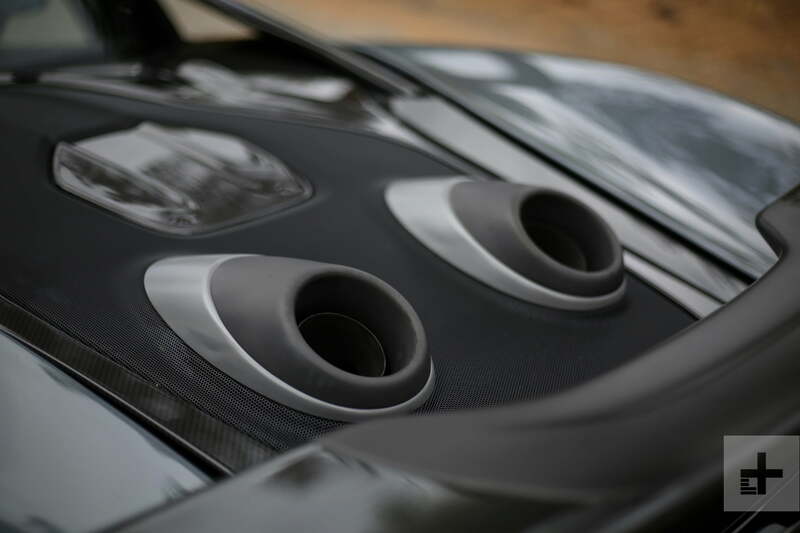 The 600LT’s integrated barbecue – we mean its lightweight, top-exit exhaust ports and mesh engine cover – serves several purposes. The principal engineering gain is weight savings (as previously noted), but the top-exit system also allows for a slipperier rear end — where the outlets would normally appear — and more effective engine cooling. As a final perk, the exiting exhaust flows over the rear wing (which has been coated in heat-resistance material so as not to melt), which generates a small bit of additional downforce. The sum of all these aerodynamic improvements is 220.5 extra pounds of downforce at 155 mph. While maintaining the curvaceous appeal of Sport Series models, the track-honed LT adds the athletic muscle tone we’ve been missing from the 570S. McLaren’s 600LT is neither an entry point nor an upscale member of the dedicated track car set. Those with less than $200,000 to spend will gravitate towards Porsche’s 911 GT3 RS. With a 4.0-liter, naturally aspirated flat-six engine, a 9,000-rpm redline, and 520 hp at its disposal, the GT3 RS is a glutton for punishment. Unlike more exotic offerings, the GT3 RS is based on a sports car (not a supercar), and therefore lacks some of the wow factor of its rivals. Buyers who scrape together $275,000 can buy into Lamborghini’s Huracan Performante and its 630-hp naturally aspirated V10. With an advanced aerodynamic system and a screaming exhaust note, the Performante is arguably the most exciting of the three. Around a circuit, we reckon the 600LT and Huracan would put down similar lap times, with the less potent GT3 RS trailing by a short margin. Like most six-figure cars, the McLaren 600LT can easily add a (nice) car’s worth of options. To keep things reasonable, our configured model would wear chicane effect paint ($4,320) and gloss black ultra-lightweight forged wheels ($6,330). To keep from destroying its gorgeous front splitter, we’d add the front-end lift system ($1,560) and to (hopefully) track our driving progress, we’d include the camera system and telemetry app ($1,610). Our completed spec would set us back $256,320. Nothing about the last few models we’ve seen from McLaren Automotive suggests the company is slowing down. The 720S is brilliant on road and track (and the just-announced track pack will make it sharper still), the Senna, while grisly, is one of the most capable road-legal supercars ever built, and the 600LT, which inherits performance tech from both siblings, is a world-class development tool for track day enthusiasts. At all price tiers, McLaren is engineering beyond the limits of its high-end rivals, and brand reputation may soon follow. February 3, 2019 Tech News Comments Off on How to watch Super Bowl 2019: live stream Patriots vs Rams free online and without commercials TODAY!